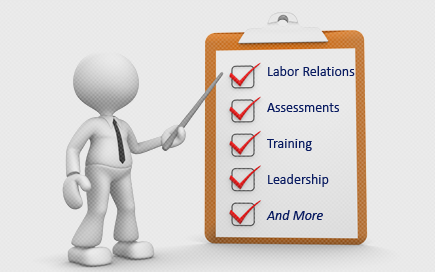 Labor Relations News Update March 17, 2014 | Oliver Bell, Inc. The last time Walt Disney World and its largest group of unions negotiated a new contract, the resort was slogging through a year in which attendance sank and Disney’s broader parks-and-resorts division posted its lowest operating profit in half a decade. Nearly four years later, the two sides are back at the bargaining table. Disney World is drawing record attendance, and Walt Disney Parks and Resorts recently announced the highest annual operating profit in its history. The more than 36,000 workers represented by the Service Trades Council — everyone from bus drivers to costumed-character performers — have noticed. “We know the money is there,” said Joe Condo, a representative for the Transportation Communications International Union, whose Local 1908 represents monorail pilots and hotel front-desk employees, among other Disney World workers. It is one of the six unions that comprise the trades council. “What everybody fails to understand is that it’s the people who are working that are the creators of all that money,” Condo said. “Since our last negotiation, we have created nearly 6,000 new full-time jobs and provided wage increases that were well above the industry average, even in the midst of one of the worst economic downturns in history,” Prunty added. Operating profit at Walt Disney Co.’s theme-park division — in which Disney World is by far the biggest individual business — dropped to just over $1.3 billion in the company’s 2010 fiscal year, the lowest point during the economic downturn, according to regulatory filings. It has climbed every year since, soaring 68 percent to just over $2.2 billion during the company’s 2013 fiscal year, which ended last fall. Disney’s last contract with the Service Trades Council, which took effect in October 2010, included three annual raises of between 3 percent and 4 percent for workers that hadn’t already reached the top of their pay scales, as well as $650 one-time bonuses for non-tipped, full-time employees. This year’s negotiations could be more combustible than previous talks. That’s because the largest of the trades-council unions — Unite Here Local 737, which represents housekeepers and food-and-beverage workers — is under new, more aggressive leadership. Leaders of that local union have aligned themselves closely with the management of Unite Here Local 362, which represents ride operators, custodians and ticket-sellers and has long been one of Disney World’s most combative locals. Together, the two Unite Here unions represent about 21,000 Disney employees, making them a powerful force in a contract negotiation that ultimately must be ratified by a vote of all workers. Disney management and union representatives met for opening talks last week. Union leaders presented an offer calling for raises of 75 cents an hour each year for the next three years for all non-tipped workers. Tipped employees would get raises of 25 cents an hour. Eric Clinton, the president of Unite Here Local 362, said the proposal ultimately would lift all of the council’s workers to at least $10.10 an hour — the same amount President Barack Obama has proposed as a new federal minimum wage. About 13,000 workers represented by the two Unite Here locals make less than $10.10 an hour, union leaders say. “It’s housekeepers, which is not easy work. It’s third-shift custodians. It’s ride operators running multimillion-dollar pieces of equipment with people’s lives at stake,” Clinton said. Prunty, the Disney World spokeswoman, said the median wage for full-time workers represented by the Trades Council is about $12 an hour, when factoring in extra pay opportunities such as overtime and premiums for certain positions. In addition, the unions have asked Disney to commit to always paying at least 50 cents more than the minimum wage. That would mean minimum starting pay of $8.43 an hour under Florida’s current minimum wage, or about $17,500 a year for someone who works 40 hours a week. Some union activists contrast that with the pay of Disney Co. Chairman and Chief Executive Officer Bob Iger, whose compensation package was valued at $34.3 million for the company’s 2013 fiscal year, according to regulatory filings. Disney declined to say how much the union proposal would cost the company. The company has not yet made a wage offer of its own. The current contract was set to expire March 29 but has been extended until July 17 while negotiations continue. While not all of Disney World’s other unions are as confrontational as the Unite Here locals, Service Trades Council President Ed Chambers said he is confident they will speak with one voice in negotiations. “At the end of the day, we all want better wages, better benefits and better working conditions,” said Chambers, who is also the president of United Food and Commercial Workers Local 1625, which represents merchandise workers and florists, among others. The woman kept pleading. So Ms. Brown did the only thing she could think to do: She climbed up on the chair in her office—to feel bigger and more powerful, she says—and “practically growled” her answer. “I was trying to say ‘no’ in a lower-octave, tall brunette voice,” says Ms. Brown, who is petite (and was blonde at the time). When asked to help or to do a favor, whether it is to donate money to charity, fill out a questionnaire or let a stranger use a cellphone, research has shown many people will say “yes” simply because saying “no” would make them even more uncomfortable. This is especially true when people have to give their answer face to face, rather than by email. And even when people do say “no,” they become more likely to say “yes” to subsequent requests. “They feel so guilty about saying ‘no,’ they feel they need to salvage the relationship,” says Vanessa Bohns, assistant professor of management sciences at the University of Waterloo in Ontario, Canada. People will even agree to unethical requests rather than risk the discomfort of saying “no.” In one of four studies earlier this year in the journal Personality and Social Psychology Bulletin, Dr. Bohns and her team had 25 college students ask 108 strangers to vandalize a library book by writing the word “pickle” in ink on one of the pages. While many of the strangers protested, or asked the students to take responsibility for any repercussions, half of the strangers agreed to deface the book—much more than the average of 29% that the students predicted. “One of our most fundamental needs is for social connection and a feeling that we belong,” Dr. Bohns says. 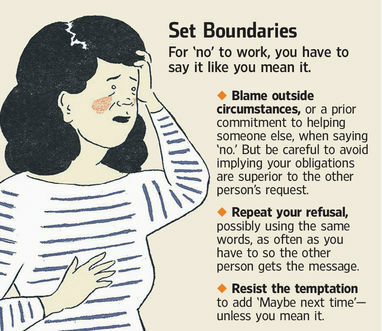 “Saying “no” feels threatening to our relationships and that feeling of connectedness.” And we worry that saying “no” will change the way the other person views us, and make him or her feel badly. Sadly, it often does hurt feelings. “No” is a rejection. Neuroscience has shown our brains have a greater reaction to the negative than to the positive. Negative information produces a bigger and swifter surge of electrical activity in the cerebral cortex than does positive information. Negative memories are stronger than positive ones. All of this is to protect us: A strong memory of something hurtful helps us remember to avoid it in the future. Even so, psychologists say, most people probably won’t take our “no” as badly as we think they will. That’s because of something called a “harshness bias”—our tendency to believe others will judge us more severely than they actually do. “Chances are the consequences of saying “no” are much worse in our heads than they would ever be in reality,” Dr. Bohns says. 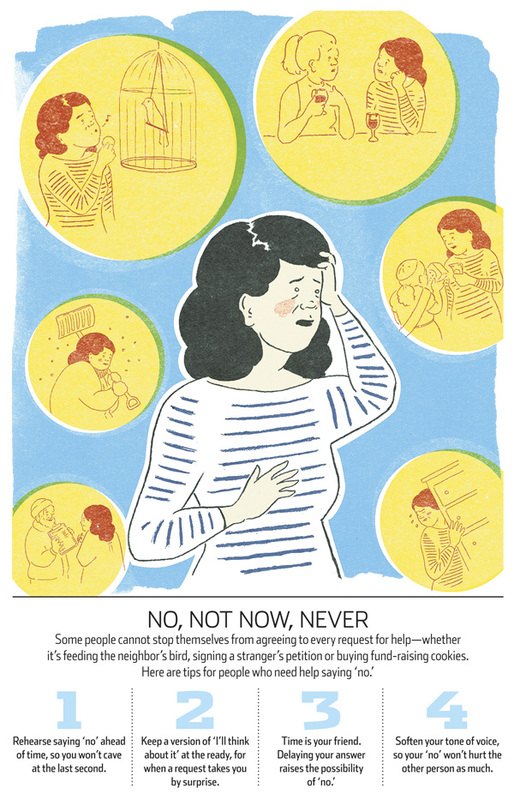 Of course, not everyone has trouble saying “no.” Some folks seem to do it reflexively. Psychologists believe certain individuals have a harder time than others. “Pleasers” hate to let others down; “doormats” are conflict-averse. And while Dr. Bohns says she hasn’t found gender differences in her research, some experts believe women may have a harder time than men, since they often are the ones conditioned to maintain relationships and worry about other people’s needs. Another important reason to say “no,” Dr. Sills says: It keeps us from caving in to peer pressure. (Refuse to write “pickle” in a library book!) “To have your own values, sometimes you have to say ‘no’ to people with whom you don’t agree,” Dr. Sills says. But what is the best way to decline a request, so that the other person gets the message and it sticks? Plan ahead. If you know a request is coming, think in advance about your response. Use a gentle tone of voice to say “no.” Blaming external circumstances may help alleviate your guilt and embarrassment at not being able to comply. If a request takes you by surprise, don’t allow yourself to assent on the spot. Keep a version of “I’ll get back to you” in your back pocket. You need to step back before committing, says the University of Waterloo’s Dr. Bohns. You want to think rationally, distance yourself from feelings of guilt and come up with a polite answer. If a person refuses to take “no” for an answer, don’t give up. Repeat your polite refusal as often as necessary. Now, when someone asks her to do something, she asks herself one question: “Will this bring me joy?” If the answer is no, then that is her answer. “I am aware that I have only so much energy and time, so I treat them like money and invest them wisely,” Ms. Brown says. She has developed her own technique for declining a request that someone just keeps lobbing: She repeats her refusal—”I am sorry, I am not able to do that”—in exactly the same words for as long as it takes. “Eventually they will get bored and defeated and stop asking,” she says. —Write to Elizabeth Bernstein at Elizabeth.bernstein@wsj.com or follow her on Facebook or Twitter at EBernsteinWSJ.